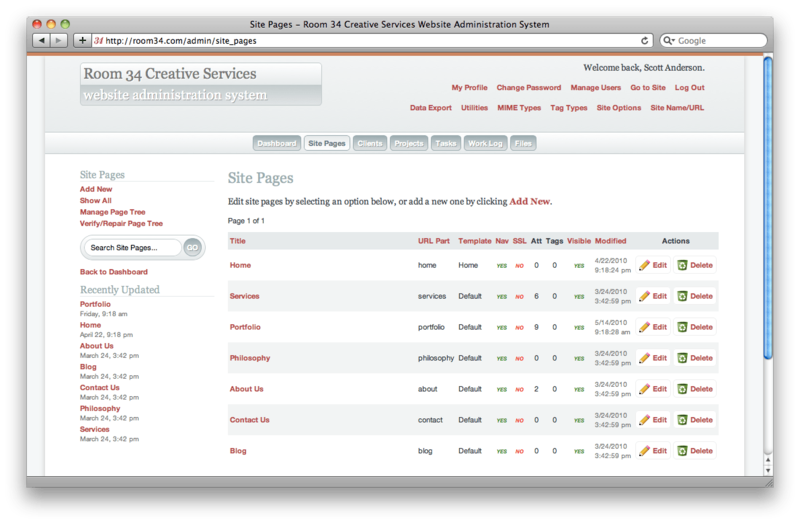 As I’ve mentioned before, my CMS, cms34, is built on the CakePHP framework. I love CakePHP, but it’s not perfect. So, the task at hand was simply to increase the session timeout period, so users could stay on the form for a longer time without losing their sessions. Seems easy enough. The CakePHP config.php file has some settings that play directly into this: Session.timeout and Security.level. Session.timeout is an integer representing the number of seconds in the session. Well, not exactly. It’s a multiplier value, and the actual session timeout duration is determined by multiplying Session.timeout by the value associated with Security.level, which itself has three possible values: high, medium and low, corresponding respectively to ×10, ×100 and ×300. I already had Security.level set to low and Session.timeout set to 1800, so really, the sessions should have stayed alive for over six days of inactivity. And yet, sessions were timing out after about 20 minutes. What gives? What gives is another value in the config.php file: Session.save. CakePHP offers a number of ways to store session data, but the default value is php, which means it uses the built-in session functionality in PHP. The problem is, PHP has its own session timeout setting (in the php.ini file), and frankly my dear, PHP doesn’t give a damn what CakePHP’s session timeout setting is. And so, with Session.save left at its default php value, my sessions were timing out after 20 minutes (the PHP default) no matter what I changed in config.php. Success! I left a browser window open on my test site overnight, and the session was still active the next morning. But along the way in my troubleshooting, I had changed my Session.timeout value to 14400, which when combined with the Security.level setting of low (that is, when multiplied by 300), had my sessions enduring for a ridiculously long 50 days! Some quick work with a calculator (although, in retrospect, I ought to have been able to divide 14400 by 50 in my head) told me to set Session.timeout to 288 if I wanted my sessions to last for 24 hours. For the past couple of years I’ve been working on a rapidly evolving CMS project called, not-so-creatively, cms34. It’s built on the open source CakePHP framework. I love CakePHP. I’ve dabbled with a couple of other frameworks (notably, Zend Framework), and while CakePHP certainly isn’t perfect, I’ve found it by far the easiest to jump into and quickly get a powerful and reliable web application running. When I started cms34 in late 2008, it was using CakePHP 1.2.0. Since then I’ve kept up with most of the minor point releases, upgrading as far as the current version, 1.2.7, as easily as simply swapping out the cake directory. And in that time, cms34 itself has gone through several major and minor revisions, currently up to what I’m calling version 3.2. In preparation for version 3.3, I’ve decided to take the plunge and upgrade from CakePHP 1.2.x to the newly released CakePHP 1.3.0. Version 1.3 offers a number of improvements, but it also includes the kinds of changes typical of a major point release that mean an upgrade is not such a simple task. I’ve run into a few issues with the migration from 1.2.x to 1.3.x, many of which are not covered in the project’s official migration documentation, partly due to the incompleteness of the documentation, and partly due to some idiosyncrasies of my application that I wouldn’t expect the documentation to cover. But since I’m probably not in this boat alone, I thought I’d share some of the problems I encountered, and the solutions I found. First things first. Download CakePHP 1.3.0. Be sure to get the release version (the one in the list with no hyphenated qualifiers after “1.3.0”). Unzip it and then follow the migration instructions to get started. For the most part this means swapping out the cake directory along with a couple of other files, and then going through all of the notes and making any necessary changes to your application. In my own experience, I didn’t have to change much: I’ve been trying to keep up with the recommendations in the version 1.2 docs, so I haven’t been using any functionality that got dropped or deprecated. The writing has been on the wall for some time with most of these features and unless your application started with version 1.1 or 1.0, you’re probably not using any of these dead methods anyway. Unlike with minor 1.2.x updates, there are a few files outside of the cake directory that need to be replaced. I found it best to just go through the entire release package and replace all files (except those I had modified) with their new versions. Update your config/core.php file, using the new version as a model. Mine had lots of changes, and I had stripped out all of the instructional comments to make the file less cumbersome to deal with. I wanted to keep those comments stripped out, so I just updated my file with what I needed, and then I kept the distribution’s version of the file in config as core.dist.php so I can refer back to it in the future if I run into any issues. There are some mixed messages in the documentation regarding the deprecation of AjaxHelper: the migration appendix says it’s deprecated but the main documentation doesn’t indicate that. I’m using it a fair amount and don’t want to have to rework all of that code, so for now I’m leaving it alone. Your line number will probably be different, but if you’re using sessions at all (and why wouldn’t you be? ), you’ll get this error somewhere. It’s not mentioned in the migration docs, but I found out here that the Session component and helper are not instantiated automatically anymore. The solution is quite easy though. In app_controller.php just make sure that you add 'Session' to the arrays defined for var $components and var $helpers. That was the biggest and most obvious problem I encountered. Once I had fixed that, I could at least get (some) pages to load, albeit with a few other issues. Namely, my theme was not being applied to the site. I’ll get to that in a minute though, because the problem I decided to fix next came in my CMS admin interface. What the…? Well, as it turns out, the methods $paginator->prev(), $paginator->next() and $paginator->numbers() have had changes to their input parameters that are currently not very well documented, in that the documentation doesn’t mention that they exist. They are mentioned in the API, but as usually happens when I refer to the API, I found it wanting, to the point that I resorted to digging into the source code directly to try to make sense of what these methods actually do. In short, where you could previously pass these methods a URL as a string (as the second parameter for prev() and next() and the first for numbers()), now they expect arrays. And numbers(), in particular, really doesn’t like that parameter to be a string (because at one point it uses the += operator to merge two arrays, one of which is the first input parameter), resulting in the Unsupported operand type error. Fortunately, in my case at least, I found that I didn’t need to pass the URL into any of these methods at all, and that just removing them altogether from the calls fixed the problem. With that minor crisis resolved, I could move back to the matter of the theme not showing up. First, some background on my CMS: I’ve built the application so that I can have a single “core” system that works for numerous client websites, organized in a way that it’s easy to deploy updates across a number of separate sites. The system is also built to support multiple sites running on a single installation (by way of a Site model, with every piece of data in every other model having a site_id field keying the content to the proper site). There are two key features of CakePHP that I rely on to make this all work: the look-and-feel (and site-specific view functionality) of each site is managed using Themes, and any site-specific controllers and views are handled with Plugins. After completing the above changes, I spent some time exploring my test application, both the user-facing site and the CMS admin interface, and so far I haven’t come across any other problems. Which is not to say I’m ready to roll this out to all of my clients tomorrow morning. I want to make the switch soon, as maintaining two separate code bases is a cumbersome task for a solo freelancer. But while things look good for now, this kind of major upgrade requires some solid testing and troubleshooting. If I run across any other issues, I’ll post them in Part Two. Anyway, there’s been one nagging problem: When users paste in URLs for links, TinyMCE converts any on-site links into “relative URLs” — it strips out the domain name. This is not necessarily bad; in fact, for the most part I would want it to do that. But for some reason the nature of my CakePHP-based CMS seems to confound TinyMCE’s ability to properly determine the relative URL. And what’s worse, the CMS includes an enewsletter editor which has to have absolute URLs, but TinyMCE was converting them to relative URLs even if the user pasted in an absolute URL. And, voilà, it seems to work! My brief foray with Bandcamp is over, and a brand new room34/music site has officially launched! This new version, I am proud to say, runs on cms34, a Content Management System I developed based on the CakePHP framework. I’ve been running numerous client sites on it for the past couple of years, along with my own Room 34 Creative Services site, but this is the first time I’ve really pushed its capabilities on a site of my own. The site has a few tricks up its sleeve (although most are in the admin interface right now), and more is on the way, including automatic transcoding of MP3s into Ogg Vorbis format for playback in the Firefox and Chrome web browsers. Yadda yadda yadda. It’s not about the web geekitude (well, maybe for me it is)… it’s about the music. I’ve posted streaming and downloadable MP3s, cover art, background information, and CD purchase links for about a half dozen of my most recent projects, and over the coming weeks I’ll be filling in the rest of my “back catalog” going back to at least 2001, and perhaps even to my debut “album” from 1992, if I can round up the old cassette currently decaying in a box in the basement somewhere. OK, it’s not really deadly at all… other than that it will kill your CakePHP session and log you out. My CakePHP-based CMS uses YUI Uploader, a Flash-based file uploader utility. It’s much better than the default HTML file uploader, because it supports a fully CSS-customizable progress bar and multiple file uploads. It’s pretty slick, even though I did tear some hair out earlier in the year trying to get it integrated into the CMS. All went well for several months, until one particular client, using Windows Vista and Internet Explorer 8, discovered a showstopper of a problem: whenever you uploaded a file, all would seem well until you went to save your changes and you’d get kicked back to the login screen, without the changes being saved. Bad news! I did some diagnostics and determined that, yes indeed, the CakePHP session was in fact being dropped as soon as the Flash process finished queuing the file uploads (an AJAX-based process), before you actually click the “Save” button… but since there’s nothing else happening dynamically on the page, it wasn’t obvious that the session had been killed in the background. I suppose by removing this line, the application is ever-so-slightly less secure, but there should be enough other precautions in place that removing the user agent check as part of the process of validating a session should not pose a significant security risk.